The problem with writing an analysis of a Bernard Hopkins fight these days is the repetition. He had hall-of-fame credentials before becoming the oldest man to win a lineal championship in 2011. Now he continues to win and school guys young enough to be his son. To be fair, Beibut Shumenov (14-2, 9 KO) has a fighting style that is fitting for Hopkins (55-6-2, 32 KO). Shumenov is strong and durable. However he lacks hand speed, and made the fatal mistake of keeping his left hand low throughout the entire bout. 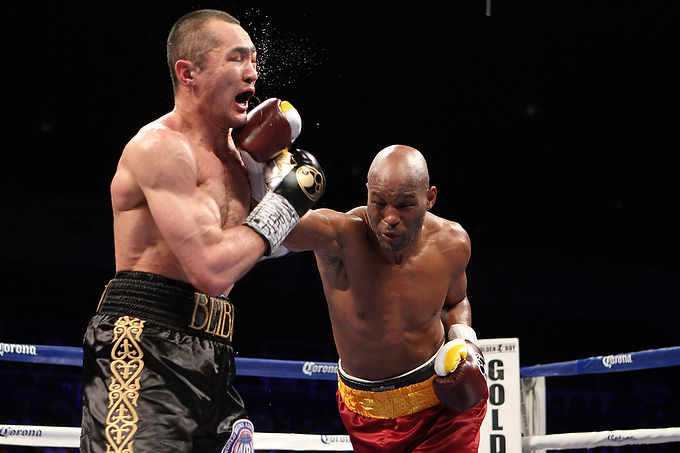 The fight began with Shumenov moving forward yet fighting at a tactical, slow pace and Hopkins picking his spots to counter and move forward as well. Hopkins, the more accurate puncher, began flowing into his rhythm by the middle rounds and the damage from constant right hands and left hooks showed on Shumenov’s face. The old teacher gave the student a boxing lesson. Hopkins mixed up his attack well. Sometimes he would throw a jab and right hand, but other times he led with the right hand and left hook. The variety of Hopkins’ attack and his slick defensive maneuvers frustrated his younger opponents. Hopkins continued to get under Shumenov’s skin by fearlessly clowning in the ring such as motioning Shumenov to come forward and making expressions at the 2004 Olympian. The punishment weakened Shumenov to the point where Hopkins scored a rare knockdown by landing a classic 1-2 jab and right cross combination. Shumenov did not appear seriously hurt yet the opportunity for a Hopkins knockout victory was suddenly possible and this brought the crowd to its feet. Hopkins continued to land flush shots but he seemed to decide that Shumenov was not ready to be taken out and won the last two rounds by continuing to outbox him. With this win, Hopkins added another page to his legacy by becoming the oldest fighter to unify two titles by winning Shumenov’s WBA title and made the second successful defense of the IBF 175-pound title. Though he clearly won the fight Hopkins officially won by split decision. Two judges scored the bout 116-111 in his favor and Judge Gustavo Padilla scoring the fight 114-113 for Shumenov. After the bout, Hopkins called out lineal light heavyweight champion Adonis Stevenson and expressed his goal to become THE light heavyweight champion by defeating Stevenson and earning his titles. Personally, I find the matchup to be a bad one for Hopkins given Stevenson’s athletic abilities and punching power, but this is a man who has proven me as well as the world wrong before so I will never count him out until he is actually counted out.